Brandon Martinez, 16, lies in a hospital bed while his father, Jose de Jesus Martinez, visits in the intensive care unit at North Central Baptist Hospital in San Antonio, Texas. 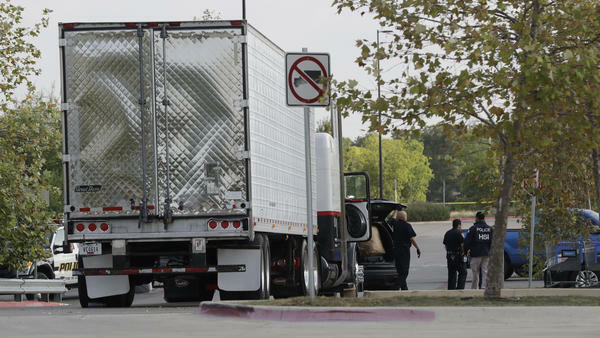 The unventilated tractor-trailer loaded with people was found at a Wal-Mart parking lot in San Antonio in July. 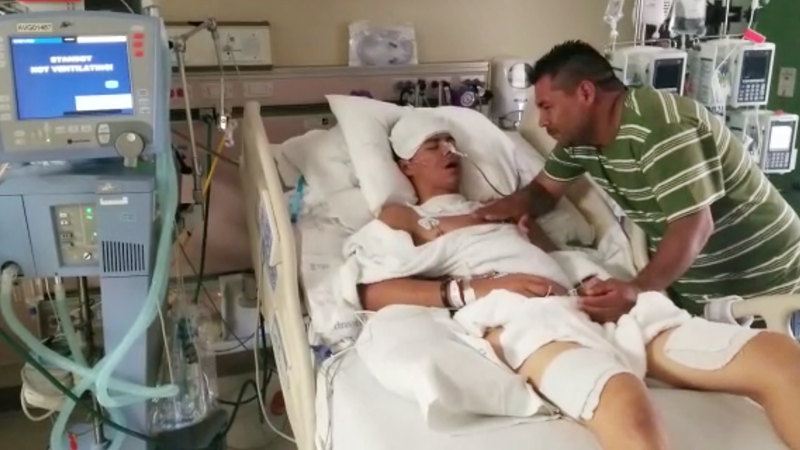 Brandon Martinez, 16, was one of nearly 40 undocumented immigrants found on a blistering summer day inside an unventilated trailer parked at a San Antonio Wal-Mart. Ten died, and Brandon barely survived. Federal officials who interviewed some of the survivors say that the human cargo was assembled and loaded into the truck in the border city of Laredo. Some had paid smugglers to take them across the Rio Grande in rafts. One immigrant said there were as many as 200 people in the back of the truck. Before he closed the door, one of the human smugglers reassured them that the truck had a refrigeration unit, but as the trip up Interstate 35 progressed they realized there was no cooling system. They took turns gulping outside air through a small vent hole, and began passing out. They pounded on the walls of the enclosure to get the driver's attention but he did not stop until he pulled over at the Wal-Mart, he says, to urinate. That's when, the driver claims, he was surprised to hear people in the trailer, opened the door and saw the grim scene inside with "bodies just lying on the floor like meat." It was a Wal-Mart employee who called 911. Many of the passengers fled on foot or were picked up by black SUVs before the police arrived. The driver, 60-year-old James M. Bradley Jr, of Clearwater, Florida., was indicted Wednesday on five counts, including transporting undocumented aliens resulting in death. At the hospital, Brandon lay comatose in the ICU, wet washcloths covering his bare skin in an attempt to cool off his body that almost cooked to death. His father, Jose de Jesus Martinez, a Colorado landscaper who's in the country illegally, sat at his bedside, weeping and stroking his son. What happened next illustrates the fraught atmosphere these days between undocumented immigrants and federal immigration agents. His father said, in Spanish, that as Brandon was being moved to another room, several agents from Immigration and Customs Enforcement (ICE) entered. "They asked me in an aggressive manner who I was and what was I doing there." "Then the lawyer and the nurses intervened to form a human wall to stop the ICE agents from apprehending me," he continued. Martinez's lawyer, Alex Galvez, was there, too. He had feared this exact scenario — that the hospital would be crawling with immigration agents. Martinez was terrified. In the current climate, unauthorized immigrants expect ICE to use any pretext to arrest and deport them. "The nurses started raising their voices, saying, 'Look, this is not the right place where this should be happening. Go outside, take it outside, we got sick kids inside,' " Galvez said in a telephone interview from his office in Los Angeles. North Central Baptist Hospital declined to confirm or deny what happened, citing patient confidentiality. ICE gives a different account of the incident in the pediatric ICU. "Even though it was a hectic situation, the agents certainly remained calm at all times and there was certainly no yelling," says Shane Folden, special agent in charge of Homeland Security Investigations in San Antonio. His office is leading the probe into what's being called el camion de la muerte — the truck of death. He says his agents were there to protect witnesses, and they had no idea Martinez was the father. "Agents don't know who those individuals were," Folden says. "They could have been members of the smuggling network trying to abscond with cellphones or other evidence." The father and lawyer say the agents eventually backed off. In fact, they say ICE officers apologized to Martinez and said they were praying for the teenager's recovery. ICE's Shane Folden allows: "They certainly may have apologized." Brandon Martinez has, by all accounts, made a remarkable recovery. He was discharged after two weeks in the hospital, and is now living at a federal shelter with three other juveniles who survived the smuggling ordeal. In all, the government is holding 22 of the smuggling victims as material witnesses against the driver. Later on they could be deported or qualify for special visas for victims of crime. In recent weeks, ICE has been aggressively arresting parents and relatives who paid smugglers to bring their kids here. They cite the San Antonio case as an example of how ruthless these smuggling networks are. Jose de Jesus Martinez insists he did not pay his son's $7,000 smuggling fee; he claims he didn't even know Brandon was traveling up from his home in Aguascalientes, Mexico, to Denver, where the dad lives. "I always told Brandon he should try to get a visa. He knew how I suffered when I came up," the father says of his own smuggling nightmare a year and a half ago. He says the coyote who was paid to take him and nine other migrants across the border held them in a Mexican hotel and extorted them for more money. "After detaining us there, [the human smuggler] left us in the Rio Grande Valley, where we walked for three days and three nights with very little water." He says he injured his feet so badly that it took him a month to recover. The father concludes, "My son knew how much I suffered. But he didn't want to listen." An update now - last month, an unventilated tractor trailer smuggling migrants across the border in San Antonio became a death trap. Ten people died from the heat. Late yesterday, a federal grand jury indicted the driver, James Bradley Jr. - indicted him on five counts, including transportation of undocumented aliens for financial gain resulting in death. Two of the migrants remain hospitalized. NPR's John Burnett has the story of one young man who barely survived. JOHN BURNETT, BYLINE: Here's the hospital scene. Sixteen-year-old Brandon Martinez is lying comatose in the ICU. Wet washcloths cover his bare skin in an attempt to cool off his body that almost cooked to death. The immigrants were trying to breathe in the unventilated trailer on a blistering summer day. His father, Jose de Jesus Martinez, a Colorado landscaper who's in the country illegally, is at his bedside weeping and stroking his son. What happens next illustrates the fraught atmosphere between undocumented immigrants and federal immigration agents these days. JOSE DE JESUS MARTINEZ: (Speaking Spanish). BURNETT: The father says, "Brandon was being moved to another hospital room when several agents from Immigration and Customs Enforcement walked in. They asked me in an aggressive manner - who was I, and what was I doing there?" BURNETT: Martinez says several nurses formed a human wall between him and the officers. Martinez's lawyer was there, too. He had feared this exact scenario - that the hospital would be crawling with immigration agents. Martinez was terrified. In the current climate, unauthorized immigrants expect ICE to use any pretext to arrest and deport them. Attorney Alex Galvez says he stood with the nurses who confronted the agents. ALEX GALVEZ: The nurses started raising their voices saying, look, this is not the right place where this should be happening. Go outside. Take it outside. We've got sick kids inside. BURNETT: North Central Baptist Hospital declined to confirm or deny what happened, citing patient confidentiality. ICE gives a different account of what happened in the pediatric ICU. SHANE FOLDEN: Even though it was a hectic situation, the agents certainly remained calm at all times. And there was certainly no yelling. BURNETT: Shane Folden is special agent in charge of Homeland Security Investigations in San Antonio, which is leading the probe into what's being called el camion de la muerte, the truck of death. He says his agents were there to protect witnesses, and they had no idea Martinez was the father. FOLDEN: Agents don't know who those individuals were. They could have been members of the smuggling network trying to abscond with cellphones or other evidence. FOLDEN: They certainly may have apologized. BURNETT: Brandon Martinez has, by all accounts, made a remarkable recovery. He's been discharged from the hospital and is now living at a federal shelter with three other juveniles who survived the smuggling ordeal. In all, the government is holding 22 of the smuggling victims as material witnesses against the driver. Later on, they could be deported or qualify for special visas for victims of crime. In recent weeks, ICE has started to aggressively arrest parents and relatives who paid smugglers to bring their kids here. They cite the San Antonio case as an example of how ruthless these smuggling networks are. Jose de Jesus Martinez insists he did not pay his son's $7,000 smuggling fee. He claims he didn't even know Brandon was traveling up from Aguascalientes, Mexico, to Denver, where the dad lives. BURNETT: "He knew how I suffered when I came up," the father says. He went on to describe his own smuggling nightmare, how the coyote who was paid to take him and other migrants across the border held them in a hotel and extorted them for more money. BURNETT: Martinez says the coyote left them in the Rio Grande Valley, where they walked for three days and three nights and ran out of water. He says he injured his feet so badly that it took him a month to recover. The father concludes, "my son knew how much I suffered, but he didn't want to listen." (SOUNDBITE OF WAX TAILOR'S "THE ROAD IS RUFF (FEAT. LEE FIELDS)") Transcript provided by NPR, Copyright NPR.